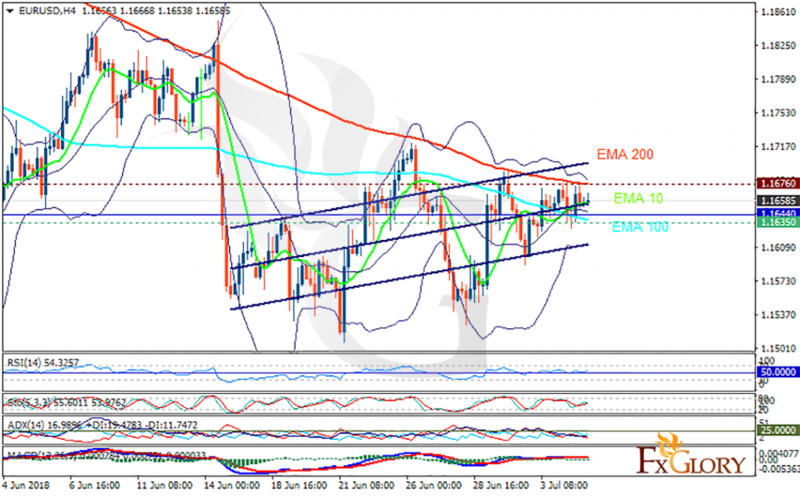 The trading session on Tuesday followed by the US independence Day gave an opportunity to EUR to recover a little. The US will release ADP Employment Change, ISM Non-Manufacturing PMI and FOMC Minutes. The support rests at 1.16350 with resistance at 1.16760 which the weekly pivot point at 1.16440 is located in between the lines. The EMA of 10 is moving with bullish bias in the ascendant channel and it is below the EMA of 200 and above the EMA of 100. The RSI is rising above the 50 level, the Stochastic is moving in middle ranges and the MACD line is on the signal line in the neutral territory. The ADX is showing a slow buy trend. To open buy positions, the price must reach 1.168 in order to target 1.17; otherwise, short positions are recommended towards 1.16.